Presales available for members only. To purchase this title, please log in or join now. Ready to become a dragon master? Have you ever stumbled upon a dragon egg and thought to yourself, "I wonder which type of scaly beast will burst forth from this delicate and dappled shell?" Well, wonder no more. 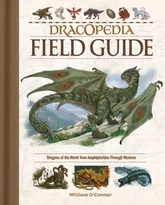 This fantasy field guide is required reading—and required packing—for both budding and expert dragon enthusiasts. This comprehensive manual identifies the dragons of the world from Amphipteridae through Wyvernae. Each genus of dragon is meticulously chronicled--from winged Coatyls to itty, bitty Feydragons—then broken down into additional subgroups to help you discover what sets these magnificent creatures apart. Uncover the biology, history, behavior, and habitat of each stunning and primeval beast through written and illustrated descriptions.